We were blown away by this indoor garden wedding today Lovelies that we just had to share it with you too! 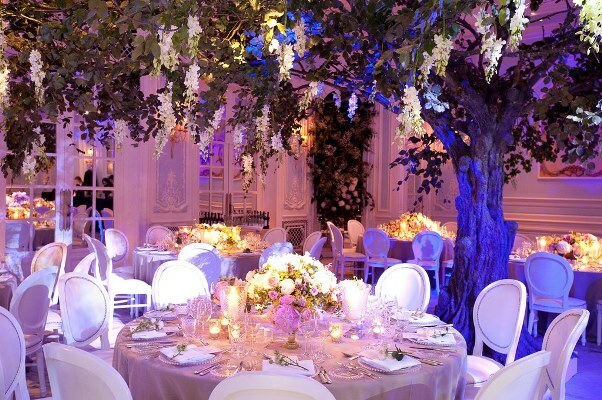 We love this idea of having indoor trees at a wedding reception. We aren’t sure if this is real or fake, probably fake, but it look gorgeous and makes such a statement piece! Even though this is an indoor wedding it totally feels like you are right in the middle of a blossoming orchid to really bring that indoor garden wedding to life. The light is just fabulous in this room too. The purple up-lighting makes the room feel more intimate and then the pin spotting on the centerpieces really make them the shining star! All of the candles bring such a glow to each table that we just love too!